This article is about the district of Wuhan. Hanyang is also a former name of Seoul. Hanyang District (simplified Chinese: 汉阳区; traditional Chinese: 漢陽區; pinyin: Hànyáng Qū) forms part of the urban core of and is one of 13 districts of Wuhan, the capital of Hubei province, People's Republic of China. Currently, it is a district and stands between the Han River (right/southern bank) and the Yangtze River (left/northwestern bank), where the former drains into the latter. It is connected by bridges with its former sister cities, Hankou and Wuchang. 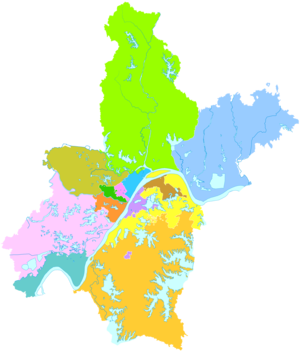 Presently, on the left bank of the Yangtze, it borders the districts of Qiaokou to the north across the Han River, Jianghan to the northeast, Caidian to the southwest, and Dongxihu to the northwest; on the opposite bank it borders Wuchang and Hongshan. Guiyuan Temple is located in Hanyang. The name "Hanyang" continues to be commonly used for the part of urban Wuhan between the Han and the Yangtze. Administratively, the area forms Hanyang District of the City of Wuhan, with an area of 108 square kilometers and a population of 510,000. The Hanyang Arsenal is known for its production of the so-called "Hanyang rifle" - an indigenous Asian copy of the German Model 1888 Commission Rifle, which was heavily used in World War II, as well as in the Korean War and Vietnam War. ^ Google (2014-07-02). "Hanyang" (Map). Google Maps. Google. Retrieved 2014-07-02. ^ 武汉市2010年第六次全国人口普查主要数据公报. Wuhan Statistics Bureau. 10 May 2011. Archived from the original on 25 October 2011. Retrieved 11 July 2011. ^ (in Chinese) Profile of Hanyang Archived 2008-03-28 at the Wayback Machine, Official website of Hanyang District Government, visited on April 19, 2008. ^ (Area numbers taken from the first line of each individual page about the subdistricts.) 首页湖北省武汉市汉阳区 (in Chinese). XZQH.org. 7 July 2014. Retrieved 23 December 2017. 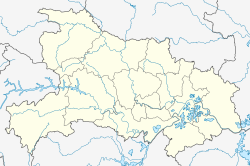 Wikimedia Commons has media related to Hanyang. This page was last edited on 27 March 2019, at 16:32 (UTC).